Dr. Renu Chakravarty, MBBS, MD (Obs & Gynae), is an eminent Gynaecologist in Chandigarh, Panchkula and Mohali tri-city region. She has an acclaimed experience of 30 years in the medical field of Obstetrics & Gyanecology and is currently managing her own Chakravarty Nursing Home in Panchkula. After completing her post graduation in Obs & Gynae in 1985 from PGIMS, Rohtak, she had 5 years stint with the Government of Iran Health Services, where she got enriching exposure to advanced technologies & methodologies comparable to T & M available in the United States at that time. After returning back to India, she started her own clinic in Chandigarh named Holy Clinic and practiced simultaneously in other private clinics of the region for 5 years. During this period, she realised the impending need & importance of the role of the private sector in the field of Obstetrics & Gynaecology. To cater to these requirements, she started Chakravarty Nursing Home in Panchkula in 1994 with the motto - "Obstetrics with the difference". Dr. Renu imparts equal emphasis to High Infertility Services using Intra Uterine Insemination (IUI), Premature nursery & deals with surgical & gynecological problems of women of all ages from puberty to old age. Dr. Renu is very popular amongst career conscious women of the region and bank on her strengths of judiciously & successfully managing their chosen time period for motherhood. She counsels the woman of today's fast world from antenatal to postpartum and addresses all anxieties of this most important phase of woman's life. 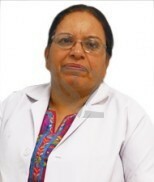 Dr. Renu Chakravarty is associated with Chandigarh Obstetrics & Gynaecological Society (COGS), as convener, where she provides training & spreads awareness to the general public about Menopause, Contraceptive counselling & postpartum contraceptive use, Diabetes in Pregnancy and general health care of women. Apart from this, Dr. Renu Chakravarty is also a member of the Federation of obstetrics & gynecological Society of India (FOGSI), Indian Medical Association (IMA) & Indian Menopause Society (IMS).